Burts quest for the perfect potato chip started over 15 years ago with just a single fryer and bags of enthusiasm. 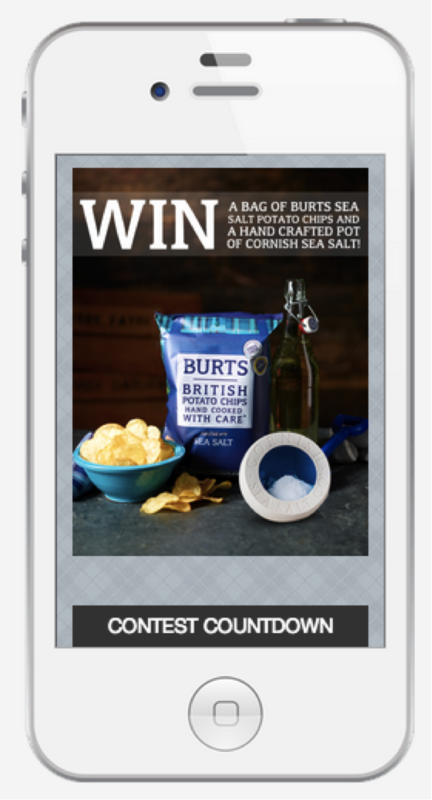 Today, Burts creates hand crafted potato chips made from the finest and freshest natural ingredients from their home in Devon, Britain. With 7 fryers on the team that cater to each chip individually, they are constantly experimenting with new flavors. As they discovered new flavors you could hear the excitement in their voices, dripping with a British accent and enthusiasm like that of a dedicated athlete who’d just won a championship. The recipe has been so successful, and the taste so indulging, that their Facebook page has amassed 17,000 fans. The tricky part was that they wanted to reach these fans in a more “direct” fashion than just a post on the Facebook page. They wanted email addresses to drive engagement and sales of new potato chip releases. That’s when Dylan, a Heyo customer and Head of Social Media at Burts, turned to the Heyo Sweepstakes Template in an effort to grow Burts email list. With 17,000 fans, Burts was hoping to capture 1,000 emails or so (approximately .6% of his total fans) and drive engagement to grow brand loyalty. Dylan set up his Facebook Contest using the Heyo Sweepstakes Template and clicked the nerve-racking publish button. The results stunned everyone. 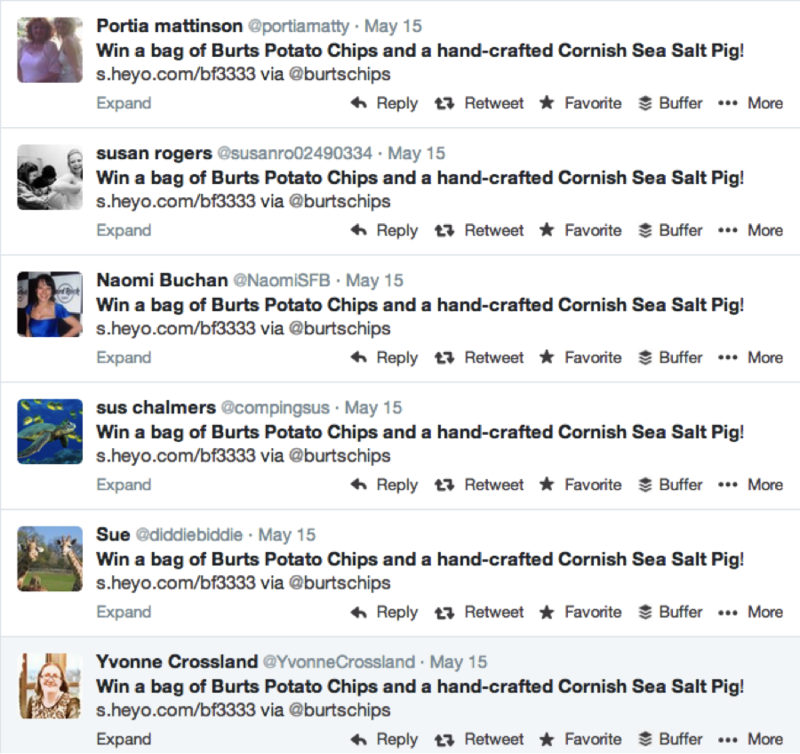 Over 5 days, the campaign attracted 4309 views and 2709 new email leads for Burt’s Potato Chips. … For those of you doing the math, Dylan was celebrating a Facebook Contest conversion rate of 62.9%. The success of the Facebook contest was not a mistake or accident. Strong Incentive: Give away something that is directly aligned with what your potential customers and followers are interested in. 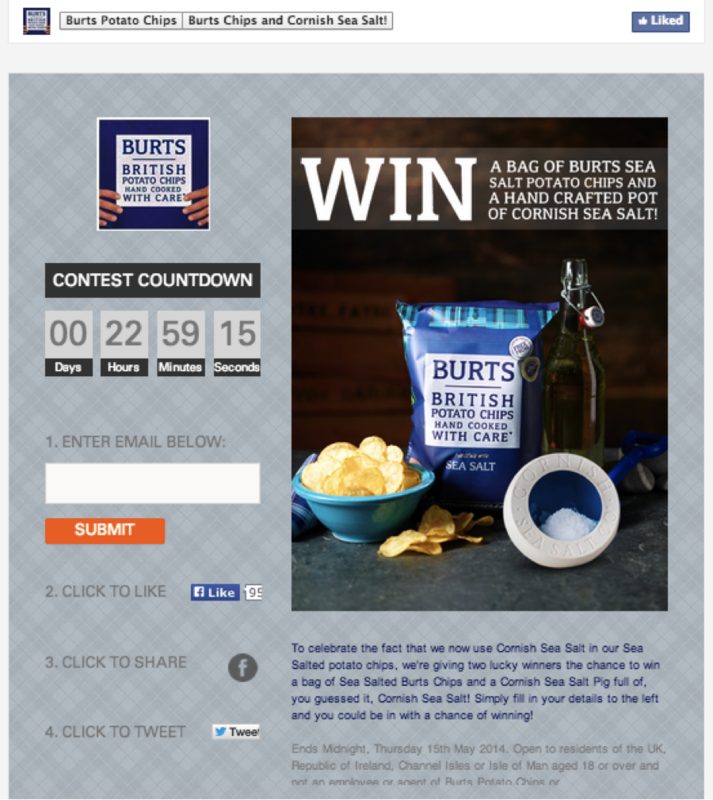 In Burts’ Facebook Contest, the incentive was a free bag of chips and a cup of Burts’ signature chip salt. Total cost? Maybe $10. Brand recognition: By dragging and dropping the Burts’ logo into the Heyo Sweepstakes Template, Dylan made sure Burts brand was highly visible. This branding is critical to quickly build trust with potential contest entrants. Countdown widget for urgency: At any point in time, a Facebook user could get distracted by a new notification or other social distraction. Dylan was smart to include a countdown in his Facebook Contest to drive the user to take immediate action. This was critical to getting a 62.9% conversion rate. Pro Tip: Only run your Facebook Contest for 7 days or less (7 days or less on the countdown). If fans see “45 days” left, they’ll leave the contest and may never come back. Easy to follow opt-in form: Most folks screw this up. Making sure your email form is highly visible and easy to enter is key. Using Heyo’s Facebook Sweepstakes Template, you can link up the opt-in form with ConstantContact, Mailchimp, Aweber, or other email marketing platform to easily manage Facebook Contest opt-ins. Pro Tip: Put them in a drip campaign to build a deep, long lasting relationship. Clear Facebook Contest entry steps: Dylan made it crystal clear how to enter the Burts’ Facebook Contest. Using the Heyo text widget, he told people that in order to enter they needed to follow steps 1-4 on the left side of the Facebook Contest. Make sure you make it simple and clear what people need to do to enter your contest. Smart URL: Heyo automatically created a Smart URL for Dylan so that when Burts’ fans saw his update about the Facebook Contest in their Facebook mobile app, they could easily click and enter. You’re likely missing out on at least half of your total potential conversions if you don’t use a tool like Heyo to make sure your Facebook Contests also work on mobile devices. Bonus tip: By asking fans to “like” “share” and “tweet” using Heyo’s Sweepstakes Template, you’ll get free traffic to your Facebook Contest from your fans social networks. Dylan got 4309 views with no advertising spend. Below, you’ll see 5 out of the 100’s of fans that tweeted the contest, driving free exposure and new emails for Burts’. Leveraging Facebook as a key part of your marketing plan doesn’t have to be a mystery. Following the 6-step system above, you’ll be well positioned to capture thousands of emails just like Burts. Click here to use the same contest template Burts did.